A Tibetan nomad completes his solo cycling tour of 13 European countries – covering over 5000 miles, and then leaves for Japan to further his mission to highlight China’s abuse of human rights in his homelands. [London, 13 August 2013] He is 42, father of two young teenagers. He says he is in good health and loves cycling. Since 2000, Rinpo Yak has cycled across 44 of the 50 states in the US – covering over 8,400 miles. In March this year, coinciding with the anniversary of the Tibetan National Uprising, Yak set out his latest global solo cycling tour from Brussels, the European Union’s Headquarters. In Europe, Yak cycled across 13 countries where he met with over 120 public figures such as parliamentarians, government officials and human rights advocates. Yak arrived in Britain two weeks ago after cycling across Europe, including Belgium, France, Germany, Norway, Holland, Spain and Italy. London was the final stop in his European leg of the cycling tour, where he had meetings with government officials, parliamentarian and NGOs representatives. In addition to media interviews, Yak also met with local Tibetan communities and Tibet support groups across Europe. On his arrival in the British capital on 2 August, Yak gave a live interview with Washington-based Voice of America’s (VOA) Tibetan Language programme from their London studio. Yak said that the European countries were showing overwhelming support and solidarity with the Tibetan people, and the public figures he met with were also candid about the growing influence of China’s economic power, indicating clear challenges to the Tibetan struggle in the years ahead. Honouring Yak’s arrival, Thubten Samdup, London-based Representative of His Holiness the Dalai Lama and members of Tibetan Community in Britain hosted a cordial reception at The Office of Tibet. They applauded Yak’s individual initiative for the Tibetan cause, which was very inspiring and motivating. Yak then took part in the Prudential RideLondon FreeCycle festival on the following day, which organisers estimated some 50,000 cyclists joined in the streets of London. Yak stood out from the cyclists as he was flying Tibetan national flag on his bike! During the week, Yak participated in an action protest jointly organised by Free Tibet and Students for a Free Tibet outside the InterContinental Westminster Hotel in central London. The two leading Tibet groups have been urging the InterContinental Hotels Group (IHG) to withdraw from their involvements in ‘The InterContinental Resort Lhasa Paradise’, which is opening soon in Lhasa. The Tibet campaigning groups maintain that the IHG presence and its naming of the hotel as the “Lhasa Paradise” is a ‘propaganda gift to the Chinese regime’ which is responsible for gross human rights abuses throughout Tibet, and severe repression, surveillance and denial of human rights in Lhasa in particular. The campaigners also said that the Chinese authorities may use the hotel and its business facilities to discuss and implement further repressive measures in Tibet. Whilst acknowledging their Tibet campaigning work, Yak visited offices of several groups, including Free Tibet and Tibet Society, and urged them to continue their support for Tibetan people. They also helped Yak with facilitating meetings and media contact. The main highlights of Yak’s London engagements were his meetings with the Foreign & Commonwealth Office, Member of Parliament, Amnesty International and the BBC World Service. Accompanied by London-based Tibetans, Rinpo Yak urged the Foreign Office to note Tibetan people’s aspirations when dealing with the Chinese government. He further urged Britain impress upon China to review its hardline policies in Tibet, address the genuine grievances of the Tibetan people through dialogue and allow unfettered access to Tibet for the media and UN. The Tibetan delegate reiterated that Tibetans in Tibet were simply calling for their freedom and the return of His Holiness the Dalai Lama. Yak spent some time with Temtsel Hao, producer at the BBC World Service Chinese programme. Later, the BBC World Service published an article about the meeting on its Chinese website. A local newspaper also reported Yak’s stopover in the Royal Borough of Greenwich, south London, which is home to nearly 100 Tibetans. At the meetings, Yak asked concerned officials to write messages of support and pledges to act in his notebooks, which he plans to present to the Dalai Lama and then the European Union and United Nations. The Tibetan Community in Britain, Greenwich Tibetan Association and Kailash Momo Tibetan Restaurant hosted receptions, farewell dinners and made donations to Rinpo Yak. Individual Tibetans offered khatas and spontaneous donations in support of Yak’s exemplary mission for the Tibetan cause. After his successful UK and European cycling tour, Yak left for Japan on the morning of 12 August to continue his mission. From Japan, Yak plans to cycle to Taiwan and possibly China. His final destination is India, where Yak hopes to receive an audience with the Dalai Lama. 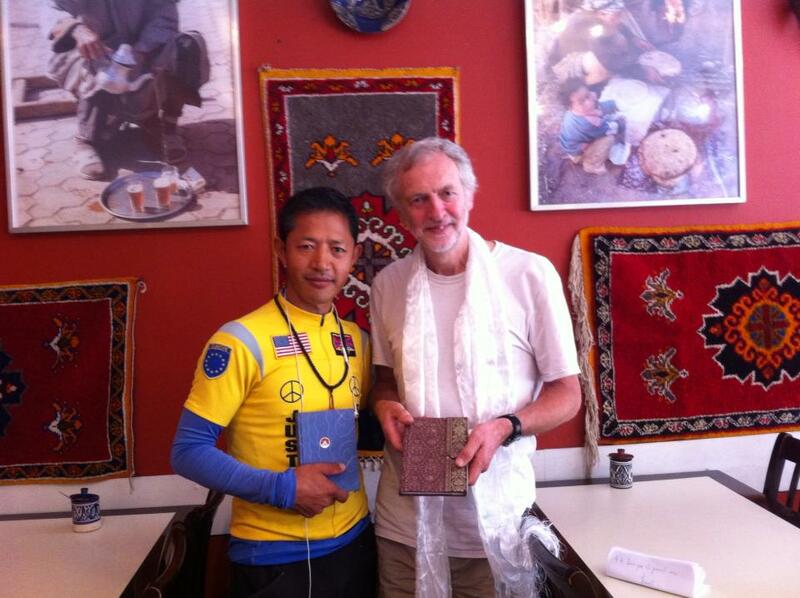 This entry was posted in Uncategorized and tagged cycling for Tibet, human rights, Jeremy Corbyn MP, Rinpo Yak, Tibetan nomad. Bookmark the permalink.